Chris Ward, 53, addressed a breakfast group this morning sponsored by the New York Law School and the Murray Goodgold Foundation. Governor David Paterson appointed Ward Executive Director of the Port Authority of New York & New Jersey earlier this year. 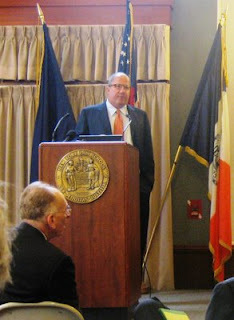 Ward served at the Port Authority under Governor Pataki and was then tapped by Mayor Bloomberg to head up the Department of Environment Protection, where his work was generally praised. He left the City to work for a private company and then became managing director of the General Contractors Association. His appointment by Gov. Paterson to his $286,702/year Port Authority job is considered nonpolitical. Ward's talk is focused around four questions: (1) What will the urban machine be that drives jobs and wealth creation in the NYC area over the next 30 years? (2) How does the development of port facilities help? (3) How will a regional rail system help? (4) How will the airport system help? His biggest eye-opener upon taking the job, he says, is that "$29 billion doesn't buy you very much." The Port Authority must therefore prioritize. He is also looking to the Federal Government to support rail freight projects as they have supported passenger travel via the highway system and Amtrak. He argues, switching the usual project ownerships, that New Jersey's planning for the ARC tunnel will rejuvenate the NYC railyards, while bringing rail freight access to NYC will help take many trucks off New Jersey's highways. Ward credits Congressman Jerry Nadler for asking good questions about rail freight in the Congress. Nadler, who is in the audience, in turn praises Ward for the direction he is taking the Port Authority. With a few pointed words, Ward takes issue with the Bush 43 Administration for understaffing the FAA and trying to promote market-based auction systems instead of addressing the capacity problems of airports in the NYC area and elsewhere. "We need a GPS-based system. The market is not going to solve the airport congestion problem." In a movie released three weeks ago, I.O.U.S.A., I watched several New Yorkers (Doug Durst, Pete Peterson, David Walker and Robert Rubin) take issue with the string of federal budget deficits under Bush 43, after a sring of budget surpluses during the Clinton years. To my mind the doubling of the official federal debt (in round numbers, from $5 trillion to $10 trillion) is only part of the tragedy. The two other big parts of the debt tragedy are (1) we borrowed the money overseas, avoiding debate at home about the war and putting power in the hands of our creditors, and (2) how little we have to show for the money we have borrowed. Think what we could have got for $1 trillion of transportation infrastructure for U.S. ports, airports and rail. Look, as Ward tells us we should, what Dubai is buying now in international connectivity. Compare what we got in Iraq for $1 trillion and many thousands of lost lives. Is the NY SUN about to set again? Crain's NY online reports that the NY Sun, a revival of a long-defunct paper by the same name, could close by Oct. 1. Investors reportedly have told editor Seth Lipsky to raise new money or shut the paper down by the end of the month. The Sun has had an excellent cultural section, some fascinating obituaries and some excellent reporting in niche areas. It's sad that if the paper folds a lot of good writers will have one less outlet for their work. But the paper has been getting thinner and thinner. Advertisers are spending more money on targeted ads on the Internet. Classifieds are shrinking. The Sun's target audience is already well supplied with publications. There is only so much anyone can read and an increasing amount of news is available instantly and for free online. This appeared in the NY Magazine Blog (www.nymag.com), The Sports Section, picking up on a NY Post story and taking it another step. In a half-trillion-dollar economy, the impact of the Yankees isn't a big deal - the permanent NYC-based jobs created by the presence of the MLB are more important. But psychologically - when the Yankees ought to be in the Playoffs without question every year given their gold-plated budget - the team's performance seems to fit with the flat performance of Wall Street. If you're running out of people to hold accountable for the tanking economy, NYU adjunct professor John Tepper Marlin has a suggestion: Blame the damn Yankees. In a study commissioned by the Post, Marlin found that when the Yankees advance all the way to the World Series, the city stands to make $141 million, factoring in things like revenue earned by sports bars. But just by making the playoffs, the team earns the city $26 million, and with the Yankees poised to miss the postseason for the first time since the strike season of 1994, this previously taken-for-granted cash can't be counted on. But don't buy that house in Tampa quite yet. The Mets, who are currently two games ahead of the Phillies in the National League East, can make the city some money, too: $21 million for a playoff appearance, and $147 million if they win the National League pennant. (The difference in numbers has to do with the fact that Mets fans are more heavily concentrated in the five boroughs than are Yankees fans.) So no matter your allegiance, let's hear it on the unemployment line: Let's go Mets! Let's go Mets! Cited also in The Yankees Missing the Playoffs Could Cost New York City Millions, FanHouse and Fate Of New York Economy Rests With Yankees, Mets, The Business Sheet. See all stories on this topic.